Arthur Chu stands behind the Jeopardy! contestants’ desk, his expression deadpan, pounding furiously on the buzzer in his hand, answering correctly question upon question. Reputedly a man of few words, here he knows just how to “chu”se the right ones to keep himself on the show. Typically moving slowly into action for the first few minutes of a game, he revs up toward the end of the first round, pushes down on his intellectual accelerator, and morphs into a general-knowledge behemoth on a rampage. Sometimes he even interrupts show host Alex Trebek, so anxious is he to pounce on the next question, leaving his competitors standing helpless, watching in awe, their buzzers mute, as he devours question after question. Leaping from category to category, hopping skittishly from one dollar amount to another, burrowing after the daily doubles, Chu cleans up the board time after time—11 days in succession. And somehow, while playing and winning, he manages to live-tweet his experience, initiating a messaging firestorm from lovers and haters, as the #chuchutrain (a hashtag created by Chu’s wife Eliza Blair ’07) goes viral. His appearance—tousled, straight, black hair; rumpled shirt; impassive demeanor—and method of play are among the targets of viewers’ vitriolic outbursts. And so it went. 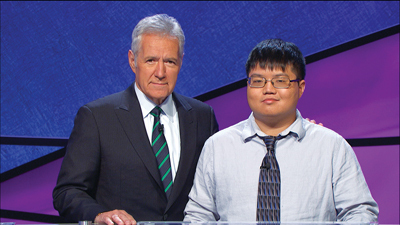 Until early this spring, when on his 12th day, Chu was defeated by Ann Arbor graduate student Diana Peloquin, after failing to have his royal Georges in order in a Final Jeopardy! question about the British monarchy. Chu’s 11-day streak on the show made him the third-“winningest” player in the game’s history with a grand total just short of $300,000 for games won plus a $1,000 consolation prize. (Julia Collins knocked him into fourth place in June.) He’s still a virtual shoo-in for a spot on the next Tournament of Champions. 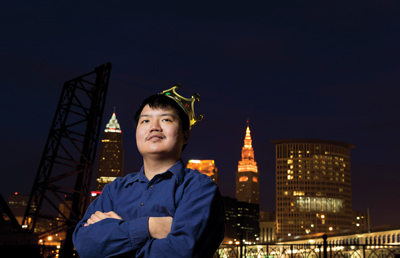 A usually gentle soul with a beautifully deep and mellifluous voice that caught the attention of Trebek, Chu, 30, loves acting in a Cleveland-area community playhouse and doing freelance voiceover jobs and standup comedy. (In his day job, he’s a compliance analyst with Family Heritage Life Insurance Co.) He also enjoys having a few drinks with friends and reading Shakespeare plays. Reading has always been high on Arthur Chu’s agenda. As a history major at Swarthmore, he spent a lot of time in the College bookstore, according to store employee Mike Harper. “He’d come in, grab a book off a shelf, and sit and read for hours, not really talking to anyone. You’d forget he was there,” Harper says. Chu took his quiet contemplation to a new level the day he got the call inviting him onto the show, which was taped in late November. He had 30 days to prepare. “Until the taping, I set everything aside and went into my own little universe, studying and watching episodes and preparing for the show,” he says. He focused less on game strategy than on cramming as much general knowledge as he could, using flash cards, looking up former winners like Ken Jennings, who reigned for 74 days, and six-day champion Roger Craig, who amassed $77,000—the highest amount won in a single day—on his second show. To allay his nervousness, Chu employed a strategy that he believes may have contributed to provoking those who accused him of seeming “flat” or “robotic” or “unappreciative” of the opportunity. He called on his experiences in community theater. “When I went up there, I said to myself, ‘OK, you’re going to be an actor for a while, you’re going to play a character, and that character is going to be a Jeopardy champion, somebody who plays Jeopardy! all the time. So that’s who people saw on the TV screen. “Of course I felt nervous, but I believe that a lot of the time the difference between doing well or doing poorly is being able to manage emotions like that,” he adds. The 12 shows Chu appeared in were taped in groups of five shows a day over just three days in November. 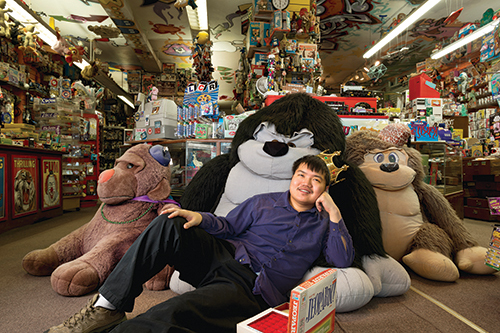 “A lot of people didn’t even know I was gone,” Chu says of his brief sojourn in Culver City, Calif. “And you’re encouraged to not publicize the date of taping as opposed to the date of your appearance, preferring that contestants help to keep up the TV magic a bit.” For example, when Chu’s first appearances on the show in late January were interrupted by the Tournament of the Decades in February, Trebek told viewers that Chu would now have two weeks to rest. Actually, his final two shows, aired in early March, were recorded on his third straight day of taping. “I got no rest. I was tired,” he says in response to those who detected a decline in his performance during his last two games. The time lag between Chu’s actual dates of play in November and the airing months later was disorienting. The fact that many more people use Twitter now than when Craig played in 2011, added to the onslaught of comments, Chu says. “Being able to react in real time, rather than waiting an hour to blog about it, greatly strengthens people’s reactions. After Chu left the show, many of the hostile tweeters recanted and became sympathetic and protective of him. For more about Arthur, visit his website at here. Watch Chu’s talk at Alumni Weekend here. How Many Nerds Does it Take to Make a Happy Couple?